This post is a tad bit delayed, but here's my Halloween costume entry. As some of you may have known, my costume took the whole week to make. I can't take all the credit since my mommy dearest sewed the dress for me, but everything else I did. I'm not sure what I was thinking, but as soon as I saw the music video, I knew I wanted to base my Halloween costume on it. I was going to go the easy route and make her outfit on the beach (either the all white dress with the candy poppers or with her in the bikini with the cupcakes on her chest), but I figured might as well go big. I wish I had taken better pictures aside the ones I've taken during the night, but these are the best I can find on my set. 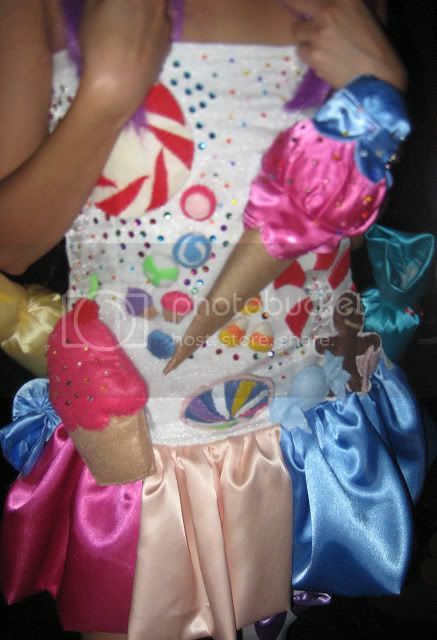 The candies that I patched up on my dress were all made in felt cloth. Yes, I cut and assembled them together and attached a velcro in the back and stuck it on my dress. Made my life so much easier since I didn't have to sew everything on to my dress by hand. The rhinestones were self-sticked, but they didn't last the whole night. Fortunately, the beads, which were sewed by hand one by one, stayed the whole night. So does it come close enough? this is amazing! 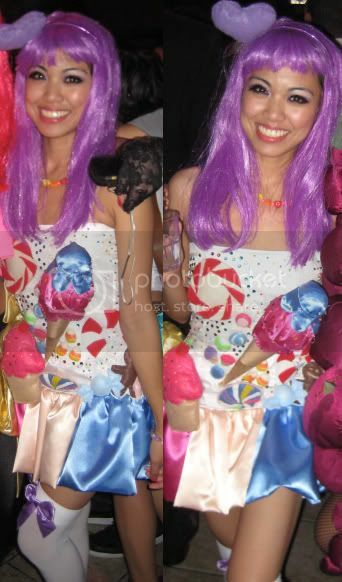 me and my friend dress up like Katy Perry too. and we are inspired from your costume. in the start we thoght your dress is katys dress!! !